8pm – 11pm Morgan and Shelby are playing Jenga. After they head up to the HOH room. They go into the bathroom. Shelby puts on her bikini and sunglasses. Shelby – get ready America we’re about to do bath time with bikini girls. Only its just going to be me in a bikini. Morgan goes and puts her bikini on over her shirt. They start their Bikini Girls show called “Bubbles and Beef Cakes” edition. Morgan – our first beef cakes .. lets do some of out own. Shane Vs Justin. Two long haired boys with nose rings from BBOTT! Shelby – who do you want to take? Morgan – I’m going to have to go with Shane on this one. Shelby – I guess that leaves me with Justin. Morgan – Shane .. he looks like Jesus. When he shaves he looks like a five year old .. Shane keep the beard. He’s a little on the short side but his body is toned. Shelby – I’ll do Justin. Justin you can’t understand a thing he says. He sings all the time and if you’re into that that’s great but I find it a turn off. Morgan – if we take into account how annoying Justin is .. Shane wins. The next beef cakes are Paulie and Cody. Paulie was a little bit of an a$$hole but if you just stare at his abs and don’t listen to a word that comes out of his mouth I think girls would like him. Shelby – I’ll do Cody. He didn’t say anything overtly sexist on his season .. so who do you think won this round. Morgan – Cody wins. Shelby gets called to the diary room and when she comes back she tells Morgan that they (BB) might do a segment on Bubbles and Beef Cakes. Morgan gets excited. 9:50pm Justin and Kryssie talk about everything they miss. Jason comes into the room after pealing off his face and says all you guys talk about is everything you miss. 12am Morgan and Shelby go to sleep. 12am – 1am Justin, Kryssie and Jason head to the kitchen. Justin and Jason start making food. Kryssie is playing Jenga. Jason eats at the table and burps trying to blow over Kryssie’s Jenga tower. Jason heads to the living room and tosses things at the bowls on the coffee table. They head to the bedroom. Justin – luckily at this point in the game we don’t have to talk too much game. Kryssie – I know. Justin – because I would be tripping out. Kryssie – I love that we have 1 more day of playing nice and then we don’t even have to pretend to like these people any more. Justin – tomorrows really important to go through with the plan .. because then it will just be 3 against 1. Man, we’ve been the underdogs this whole time. Kryssie agrees. Jason – that changes tomorrow!! Because I’m going to kill this hoes! Justin – I’ve been through a lot kid. I’ve been sexually abused too. I never told you that. Jason – I lied about it last time and then the psychologist asks… Big Brother switches the feeds to Morgan and Shelby sleeping. Are the LNC truly delusional?? They think THEY are the underdogs in the game?? Jason with his built in fan base that has kept him and the LNC alive this game? I hope it’s not 3 LNC against 1 BS as it will truly be boring to watch the burp and fart show till the end! At least Morgan and Shelby offer up a little entertainment that the others don’t. I am crossing my fingers either Morgan or Shelby win the veto! I can honestly say I have never seen ppl that are as DELUSIONAL as these three. I mean straight up mind boggling. Just Wooooow is all I can say. If Jason won HOH. I would love to see Production not give him a food Basket for rubbing boogers on other people’s property. Take away his pillows for rubbing his sweaty armpits on their pillows. Take away his letters for threats outside of the house. Or better yet loses veto at the hands of Shelby tells him start packing little man and watch him sulk like a little school girl all week! I would rather see him get voted out this week. He needs to go back to the basement. yup. two weeks of being america’s nom and having the majority every single week, losing competitions and still getting your targets out. totally the underdogs. I stopped watching the live feeds this weekend. Could not stand Jason’s and Kryssie’s behavior and all the disgusting things out of their mouths. No class whatsoever. And somehow Justin fits in there with them. Their name is the Delusionals. They think they have been the underdogs all season. They think everyone loves them. Delusional!!! If Shelby or Morgan don’t win today…I am done for the season. Let’s go Ladies! Here is to hoping that somehow Shelby or Morgan will win the veto today. Need Jason out to finally give the remaining 4 a level playing field in the finals. A vet in the final 3 with America being the final vote to win is an unfair advantage if there is only one vet. That is the one thing that Monte had right from day 1. Worst … Season … Ever!!! Edit…. My mind is mush Thanks Cat for the correction.. BB16 was the worst the one with Frankie/Derrick/Cody .. So glad to see others can’t stand Jason. He’s behavior is horrific. Kryssi no better. I get it’s a game, but really? I can’t believe the things that come out of their fowl mouths. I loved Jason in his season but to call them girls the c word and that he’s going to steal the family’s social security #s and talk so bad about how undeserving they are to win the game what makes him think he’s deserving? They have played just as good as he said not better! Fine job on the photos Dawg. Bravo! I don’t think it is fair that Justin gets to play in the Veto Competition because he is already safe. Shelby and Morgan will not be winning this POV their times are greater than Justin’s. I’m going to be shocked if Justin doesn’t use the veto on Jason. I thin it’s safe to say Justin, Jason, Kryssie and Morgan final 4 .. Shelby will be evicted come Wednesday. Unofficial times shows Jason wins the Veto.. With that I’m thinking Jason will win BBOTT. Get the Kraken ready, we’re all going to need it now! Welp looks like Shelby is going home and I will be cancelling my subscription. I refuse to watch Kryssie or Jason in the final three. Most disgusting, vile, delusional POS I’ve ever seen on BB and that is saying alot. And if they do a bbott 2 and there is an America’s nom there is no chance in hell I’m watching. I’m truly disturbed how this season turned out. 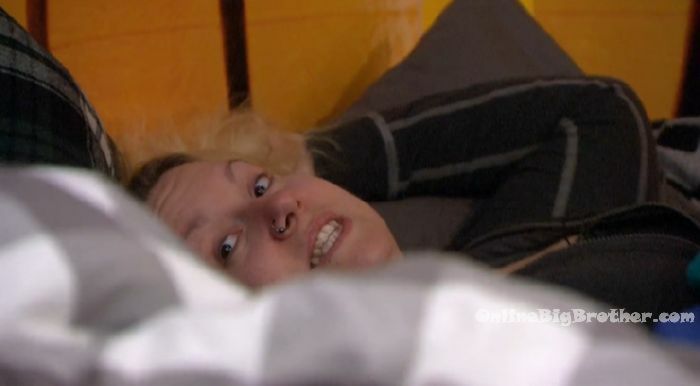 Well, not who I thought would win this Veto, and Shelby going home I guess. Like I said before, the most deserving rarely wins. At least this one doesn’t leave a bad taste in my mouth. Noone had an advantage in this one. Kryssie finishing in the time she did is evidence of that. If jason has won the veto then the final care package has ruined the season. I wish Justin could have been the renom. I would rather have seen Shelby and Jason in the final 3 battling it out, then lose shelby this week and most likely either jason or morgan next week. What a year for Americans….. Trump as president elect and a BBOTT winner to match. Great representatives of the American Twitter culture. Thank God I am Canadian.